MSNBC is billing tonight’s Democratic debate as the first one-on-one showdown between Bernie Sanders and Hillary Clinton. The network is technically correct, since the two Democratic presidential candidates just participated in a CNN Town Hall, but it wasn’t a debate. 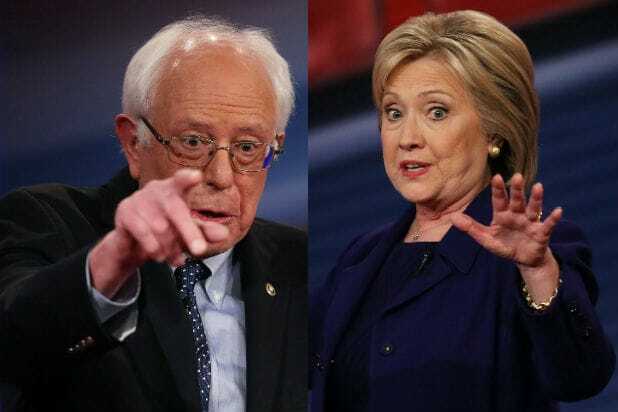 Tonight’s event should finally offer Clinton and Sanders their first opportunity to square off following their virtual tie in the recent Iowa Caucus. NBC News’ Chuck Todd and MSNBC’s Rachel Maddow will moderate the event from the University of New Hampshire. It will be the final public appearance for Sanders before he hosts “Saturday Night Live” this weekend — oh, wait — nevermind. That’s actually Larry David. Refresh this page early and often for the best Twitter reactions during the debate. #DemDebate Oh boy another debate. 6 PT: And we’re off. Todd and Maddow are explaining tonight’s event. MSNBC’s Tamron Hall is ready. 6:08 PT: What if it’s an insurance commercial? #DemDebate drinking game: drink when either one says the word "progressive"
its a fight among who can give away more stuff. lets hope voters realize people end up paying for the things they claim are free. I'm confused. Sanders is calling for revolution but explaining how all his stances aren't revolutionary. Wow, I really don't like @HillaryClinton tone. The dynamic is reversed with Sanders on the defensive as frontrunner in New Hampshire and Clinton on the attack as underdog. Fascinating. Whoa this is a real debate. 6:35 PT: How does she tweet while on live TV without a phone in her hand? 6:53 PT: It appears to be halftime… we hope Hillary makes it back from the bathroom in time. It's weird how in this #DemDebate the moderators are letting the candidates… debate. 7:32 PT: Clinton email talk time! 7:41 PT: How many more Democratic debates are there? 7:52 PT: Todd promises to squeeze in a bunch of question in the next few minutes. Is this going to be the lightning round? 7:55 PT: It’s the “home stretch” according to MSNBC. When was the last time a candidate for #POTUS said the phrase "I was on the picket line…" during a #DemDebate!? @BernieSanders inspires!! Flipping after #DemDebate? Post-game coverage on Fox News anchored by @ShannonBream; at CNN, @donlemon kicks off coverage at 11pET. 8:01 PT: Clinton will consider Sanders as a running mate. We think. It’s mutual. We think. Goodnight everybody!